Photo cake is absolutely delicious and looks very pretty with different colourful looking. The exotic taste of fresh Photo, topped with fresh cream brings refreshment to your taste buds. Order this 2 Kg Pineapple Photo Cake online cake delivery in Noida, Delhi to your loved one. 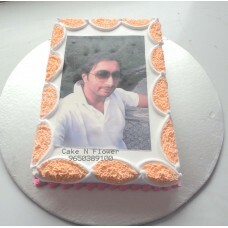 Sending cake to Delhi, Noida is one of the best way to celebrate sweet moments. Surprise your loved one ! Try it now !! Note: 1. All cakes are available in all flavours, in all shapes, in egg and eggless.